It is a thin but dark negiya, from the time of writing. Assuming the negia created a mem for a moment (I'm not saying one way or the other at the moment) then it is pasul and Rav Friedlander was clear that this is the widely accepted psak. We had a similar discussion a few months ago regarding a chaf peshuta in which a dalet or reish below hit it in the midst of making the head. I am leaving that assumption (that it may have been a mem for a moment) as a safek! Why would you not say that you can assume according to the normal way a Sofer writes the letter, the right Rosh would be written in a way that likely would create a mem before finishing the ayin. Ie - I would think that's a likely case, not a 50/50 safek. A safek doesn't have to be a 50/50 chance. I can not accept the dugma of lamed, since I am not meikal like the Keset if the tzavar was written after the caf. My understanding of that hallacha is, that whenever the yud part of the lamed [completely] enters the dalet or reish, they are passul. And the same, if the akev of the beis enters these letters and they look like a hay, they are passul, regardless of lefties or righties. Rav Moshe: If the possibility of a Mem is a Safek, why is this not a S'feika D'Oraisa? What is the basis to be Meikal here? Please advise. Is it OK if I make blog about this question in Hebrew. In english it will be too long [complicated]? I didn't put it on this forum, because it's in hebrew and long. Thank you for the Hebrew posting. (1) R' Akiva Eiger is not Someich on the SM"K leKula, because, as he says in the Teshuva, most disagree. He is Choshesh leChumrah that the Sheim Hashem may still have Kedusha despite the apparent Chok Tochos. 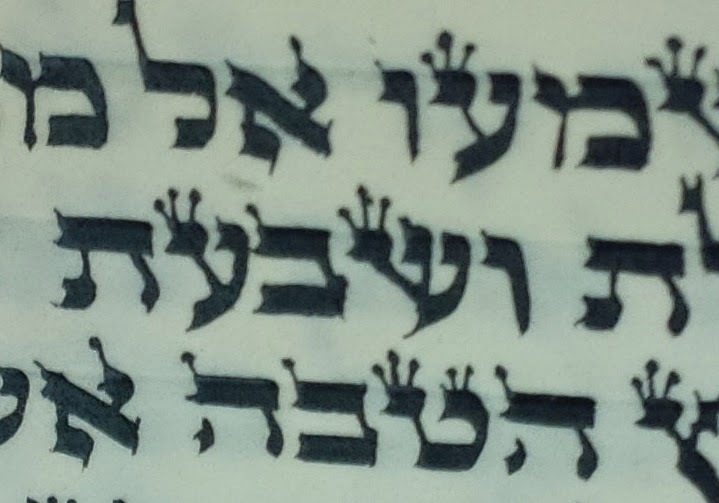 (2) Even if the sofer wrote the entire right-and-bottom of the Ayin in one stroke (lifting the Kolmus to then write the left part), it would still look like a Mem - unlike the case of a Lamed B'toch-Chof. If so, any mention of "just for a second" and "Lo Hitkaven" appear irrelevant. Reb Moishe, according to your opinion is this mehudar? can we assume somebody spending 120$ to buy alter rebbe ksav wants to purchase a mezuza with this shaila? The question was not, if it is mehudar. I understood the question as request for a kula. To be machmir nobody needed to ask me.